September 19, 2014 – NASA Television will broadcast live the Sunday, September 21, Mars orbital insertion of the agency’s Mars Atmosphere and Volatile Evolution (MAVEN) spacecraft, from 9:30 to 10:45 p.m. EDT. The broadcast also will be available on the agency’s website. The program, originating from the Lockheed Martin Facility in Littleton, Colorado, will feature live camera views of mission control, interviews with senior NASA officials and mission team members, and mission video footage. The spacecraft’s mission timeline will place the spacecraft in orbit at approximately 9:50 p.m. EDT. Coverage will wrap up with a post-orbit insertion news conference, targeted for about two hours after orbital insertion begins. NASA TV coverage will air on NTV-1 (Public) and NTV-2 (Education). Members of the public are invited to follow the day-long NASA Social event on Sunday by following the hashtags #MAVEN and #JourneytoMars on social media channels including Twitter, Instagram and Facebook. Twitter updates will be posted throughout on the agency’s official accounts @NASA, @MAVEN2Mars and @NASASocial. MAVEN launched on a United Launch Alliance Atlas V on November 18, 2013, from Cape Canaveral Air Force Station in Florida, carrying three instrument packages. It is the first spacecraft dedicated to exploring the upper atmosphere of Mars. The mission’s goal is to determine how the loss of atmospheric gas to space played a role in changing the Martian climate through time. MAVEN’s principal investigator is based at the Laboratory for Atmospheric and Space Physics at University of Colorado, Boulder. The university provided two science instruments and leads science operations and education, as well as education and public outreach, for the mission. Lockheed Martin built the spacecraft and is responsible for mission operations. NASA’s Goddard Space Flight Center in Greenbelt, Maryland, manages the project and provided two science instruments for the mission. 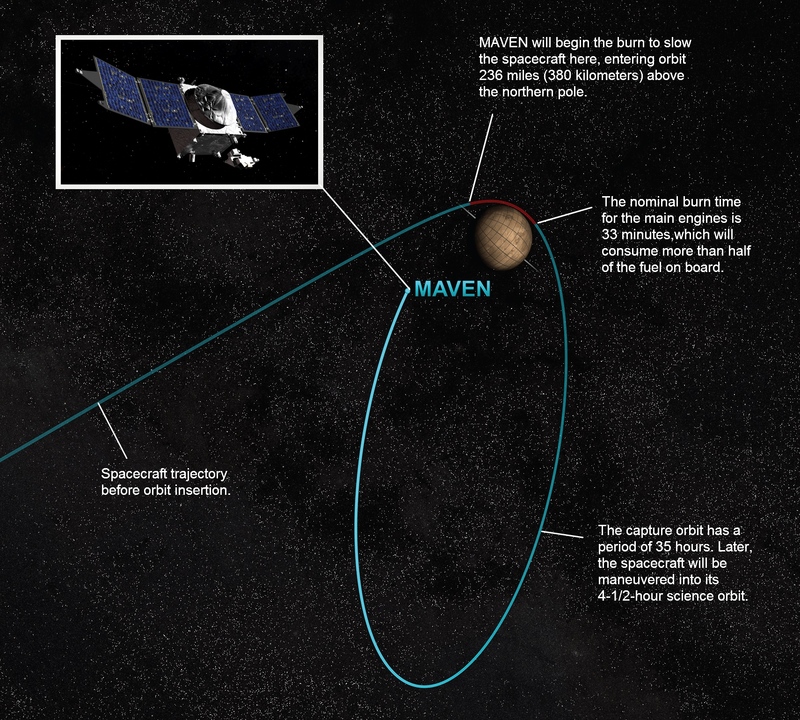 The Space Sciences Laboratory at the University of California at Berkeley provided four science instruments for MAVEN. NASA’s Jet Propulsion Laboratory in Pasadena, California, provides navigation and Deep Space Network support, and Electra telecommunications relay hardware and operations.